Finished art … with an outboard motor! Skilled craftsmen have always impressed me. I’m no rookie when it comes to working with building materials and power tools, but seeing some of the work that a talented carpenter can do, reminds me of seeing a canvas filled with the aftermath of a fine artist’s brush strokes. My hunting buddy Brad Taylor is one of these artists. Brad, a full-time school teacher, has been building duck-hunting boats for about as long as I’ve known him. And it seems like with each one he builds, his work gets even more impressive. 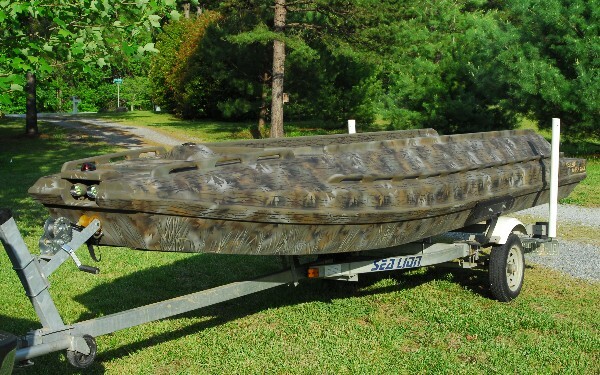 Brad, under the name Toller Boatworks, spends his summers shaping marine-grade plywood into narrow vessels that any duck hunter would be proud to own. I’ve been fortunate enough to watch the evolution of several Toller Boatworks pieces from the first form being used to their first trip across water. I’ve even had the pleasure to take a duck or two from the confines of more than one of Brad’s creations. The time and detail that Brad puts into making everything perfect are the reasons why I’ve never heard one complaint from one of his customers. Because it’s a part-time gig, Toller Boatworks builds only a handful (no more than four, I believe) of custom boats a year. The reason Brad and Toller Boatworks are top of mind for me in February (duck season closed almost a month ago) is because I’m hoping to get a shot at one of Brad’s boats next week at our annual Ducks Unlimited banquet. The DH Mini is just 11' long, yet big enough to get hunter and pooch (plus a couple dekes) to a hunting spot! This year will mark the second time that Brad has built a boat for our chapter to raffle during our event. The raffle this year, is for a DHMini and I’m hoping to win! 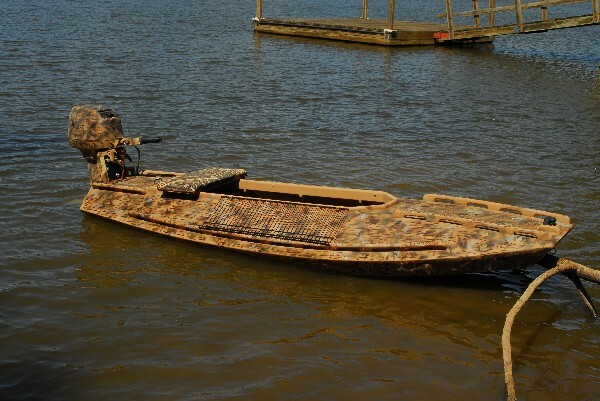 It’s a one-man (and hopefully a dog too) duck-hunting boat that I can’t help but see visions of Sage and I sitting in. For what it’s worth, tickets still remain for the boat. And you do not need to be present to win. If you’re not from these parts, though, you would need to arrange transfer. Tickets can be purchased from Brad directly – details available on his site. Catch up with Brad at http://www.TollerBoatWorks.com. I’m looking forward to making my first trip to the Dixie Deer Classic next week. In addition to seeing what new hunting-related products will be on the shelves this summer and fall, I’ll get a chance to meet Josh and Tyler from Riverview Outfitters. I’ll be joining a small group to hunt with Riverview later this fall on an archery hunt during, what should be, the middle of the rut. I’ll be sure to take some photos of anything noteworthy while at the Classic to add to AHT. Get a FREE AHT Sticker!!! Want a FREE “A Hunter’s Tales” sticker? Here’s the deal: Just sign up to receive updates when there has been a new post to A Hunter’s Tales. How do you do that? Just click the button at the bottom of the left column and enter your e-mail address. Get a FREE AHT logo sticker in either black on white, or white on black (shown here). If you’re a WordPress subscriber, all you have to do is click the button. No worries, you won’t get any spam and no one else will get your e-mail. You’ll only hear from AHT when there’s a new post we think you might be interested in. And the first 20 people to do it, will get a complimentary sticker of the AHT logo. If you’re among the 20, we’ll send you a note to get a shipping address and to get your selection of black on white, or white on black. High school bus trips taken by boys athletic teams have a way of leading to long-time memories for those student athletes on them. Putting 15 or so 14- to 18-year-old boys together for more than three minutes has its way of leading to shenanigans. And our trips were no different at Wellsville High School a couple decades back. But outside of the occasional wedgey-gone-wrong by Jeremy Hyer, we rarely had anything as cool as what happened to the boys basketball team at Rushford-Peterson (Minn.) on a bus trip returning from a tournament last month. According to the AP, the team’s bus struck a beautiful 180-class typical 10-point on the 28-mile trek home. The team, filled with several young hunters, sought and received permission to take possession of the recently-expired deer. To the Minnesota DNR’s credit, permission was granted under the caveat that it would become an educational tool for the school’s biology department. 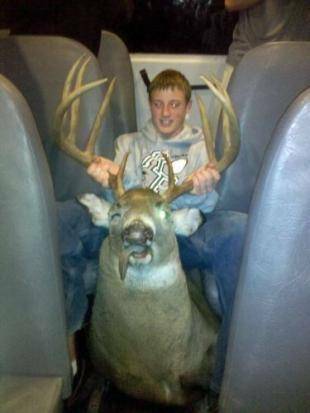 To top it off, though, the team was able to make the remainder of the trip home with the 10-point buck riding (pardon the pun) shotgun – in the aisle of the bus! Imagine how many pictures were taken on cell phones during that trip. That trip tops a wedgey any day of the week. A lot of traffic has come through this blog thanks to the lively discussion of the Wiktor sheds referenced in earlier posts. I’ve purposely decided not to comment to several of the posts. I’ve tried to only post the facts as they have been presented from reputable sources (i.e. – actual published articles, etc.). The debate is great and there stands a strong chance we’ll never know the whole story behind the shed find. That said, I hope those that have come to the site to read about that topic have found other parts interesting too. Just a reminder that you can sign up to receive an e-mail when the blog has been updated. Because I do not get a chance to update it on a daily basis, this is a good way to find out when to stop by to read new posts. It is the only communication you’ll get from me (A Hunter’s Tales does NOT spam!). It’s also very easy. Just click the button in the left column and provide the e-mail address you’d like to receive the updates at. I’m happy to report that negotiations with a fantastic storyteller are nearly complete to have our first contributing writer with an outdoors article at A Hunter’s Tales! Look for a post by the special guest to come in the next couple weeks. Depending on how the weather is in Hawaii, it should have pictures included!